Jack Trice, an offensive lineman playing in his second game for what is now known as Iowa State University, died the following day, October 8, 1923, from injuries sustained during the game against the University of Minnesota. Trice was alleged to have been targeted by the Minnesota team for rough play and suffered a broken collarbone on the second player of the game. Continuing to play through the pain, he was trampled later in the game by three Minnesota players and taken to the hospital where he died the following day. Iowa State University refused to play football against the University of Minnesota for 65 years. The death of Trice was made even more poignant by the discovery of a letter he worte before the game in which he offered his hopes for his performance. 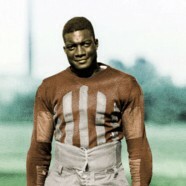 In 1997, after persistent efforts by student groups, faculty and alumni as well as high profile public figures (including Paul Newman, Hubert Humphrey, and Nikki Giovanni) Iowa State University renamed Cyclone Stadium as Jack Trice Stadium, the first and currently the only Division 1 stadium or arena to be named after an African-American.